Filmbar70 and el diabolik screening and party! | El diabolik's World of Psychotronic Soundtracks. Filmbar70 and el diabolik screening and party! Mark your calenders, the Filmbar70 and el diabolik film screening + psychotronic party is on Thursday the 22nd of March at the Roxy bar and screen, London. 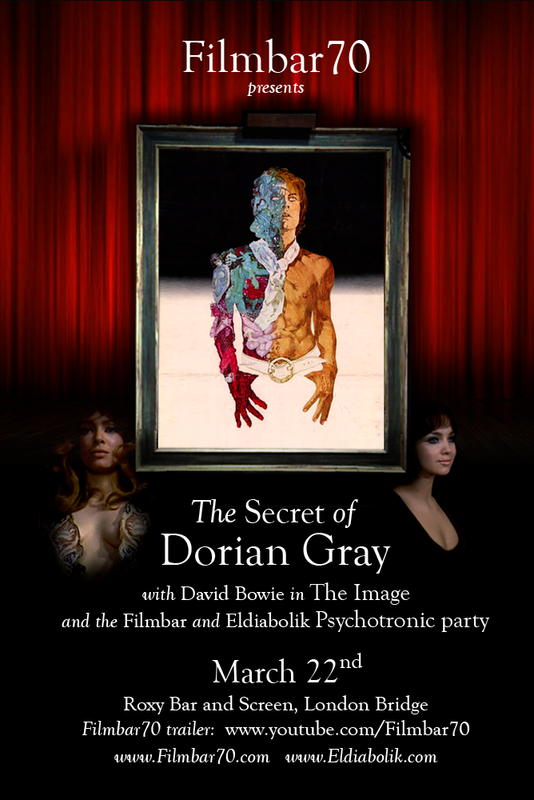 We will be screening Massimo Dallamano’s psychotronic classic ‘The Secret of Dorian Gray’. Plus Michael Armstrong’s David Bowie starring short ‘The Image’ Yours truly (el diabolik)will be DJing before the films, then much more at our psychotronic disco party after the films. All this for £5. Get yourself along and say hello! Check-out the excellent event trailer. Facebook page for the event. Previous PostTracklisting for Epispde 15Next PostPlease note, the event is on THURSDAY the 22nd, not Wednesday as I originally posted. Oi Mr Eldiabolik it’s on Thursday not Wednesday!